Jan Simek, Distinguished Professor of Science, finished his last day as interim head of the anthropology department July 31, 2017. During his three years of service in this role, he oversaw the move to Strong Hall and the hiring of several new faculty and staff. “It has been my honor to have served as interim head of this fine group,” says Simek, who sees exciting prospects on every angle of the horizon for anthropology and looks forward to rejoining the department faculty. Simek, however, has not lost a step on his research on the Native American cave art and archaeology of Eastern North America. 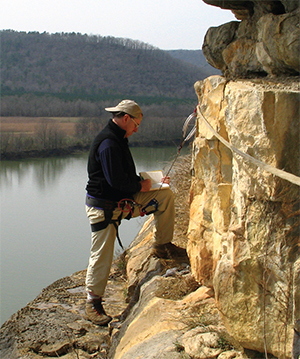 A renowned expert on Old World Paleolithic archaeology, Simek has discovered and documented a wealth of new rock art in Tennessee and throughout the region – in caves and on the open landscape – with a remarkable range of different repertoires. Simek is researching the sacred meanings of pre-Columbian art not just from the paintings, but how the many thousands of these paintings are created using a range of analytical techniques, as well as how they are distributed on the Tennessee landscape, high and low.